Pawar travels provides you car rentals from “Pune to Asthavinayak” places.Gana meaning people,Pati meaning leader.Thus it means leader of people.Ganpati is a best warrior as well as excellent dancer. ’OM’ which is the symbol of Brahman or the universal soul. The Ashtavinyak places are Moreshwar,Chintamani,Siddhivanyak,Mahaganpati,Giriatmaj,Vighneshwar,Ballaleshwar, Viradvinayak. 1) Shree Moreshwar(Morgaon): Situated on the banks of river Karha which is in Baramati Taluka. It is said that the shape of this place is like peacock and once upon a time there used to be many peacocks so it is named as’Morgaon’. 2) Shree Chintamani(Theur): This place is called Sthavar or Theur which is very close from Pune having mythological importance. 3) Shree Siddhivinayak(Siddhatek): Lord Vishnu got Siddhi at Siddhatek as such Ganesh idol is here is called as Siddhivinayak. Morya Gosavai of Morgaon and Narayan Mahaaraj have attained siddhi hear. 4) Shree Mahaganpati(Ranjangaon): Mahaganpati means powerfull Ganpati having eight, ten or twelve hands. Lord Shivshankar got victory over demon on worshipping Mahaganpati. Therefore it is called “Tripurari Varado Mahaganpati”. 5) Shree Girjamaj Vinayaaka(Lenyadri): The only place amongst all Ashtavinayaka places, which is situated on mountain. Lenyadri is situated on the North-West banks of river kukadi which flows between Junnar and Golegaon. 6) Shree Vignheshwar(ozar): Vighneshwar temple is situated on the banks of river kukadi. Among Ashtavinyak temple Vignheshwar Vinayak temple is the only temple with golden attic and meridian. Ozar is 85 km from Pune. 7) Shree Ballaleshwar(Pali): Village Pali is situated between Sarasgad fort and river Amba flowing on other side. This place is very famous and is said answer to the question asked in the form of flower,leaves etc from Ballaleshwar. 8) Shree Varasvinayak(Mahad): In ancient times it was called as Bhadrak or Mahad, having beautiful surroundings. 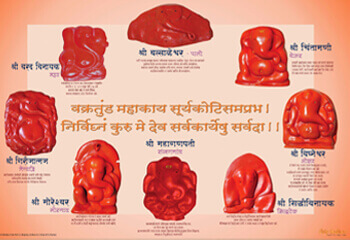 Shree Varadvinayak is worshipped thrice a day. Two festivals are celebrated on a grand scale those are Bhadrapada and Magha Sudh Pratipada to Panchami. Devotees can perform prayers their self . Shree Ganesha chaturthi is observed by many devotees, this chaturthi is very dear to Ganesha. Ganpati is beyond three stages of human body, chaturthi is the fourth stage. This vow is observed strictly by devotees to get rid of all their problems in their life and live a happy life.